This survey included many of the “common questions” from the World Internet Project, which are asked in a variety of countries across North and South America, Europe, and Asia. Therefore we have the ability to compare not only the Middle Eastern countries in our study to each other, but also to provide points of comparison with non-Arab countries around the world. Because no other countries were able to share data collected in 2015 at the time of publishing, we used data from a variety of nations collected in 2013, the first year our study was conducted. 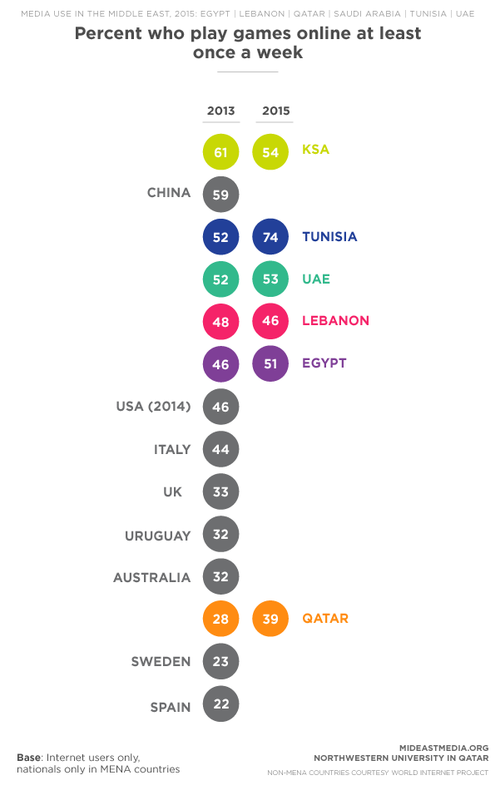 The following charts place MENA countries into a more global context based on results from 2013. 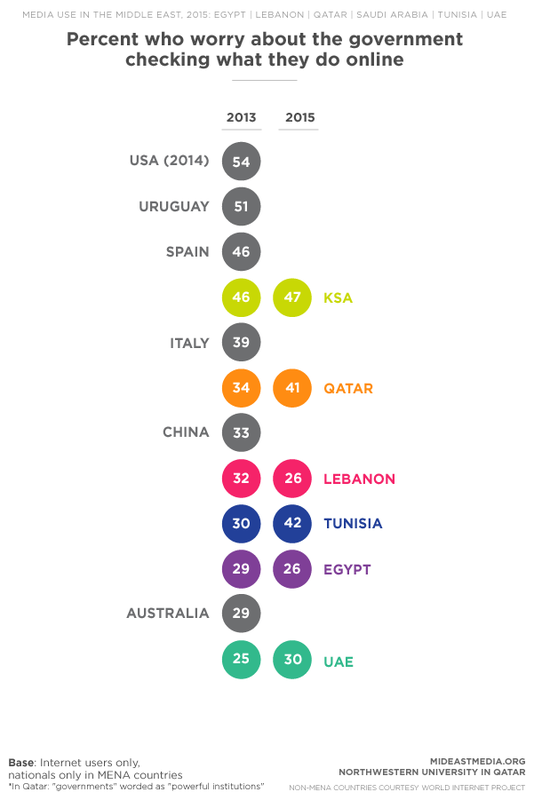 With the MENA countries in our study, 2015 numbers have been included to show how they have changed since. We look forward to seeing and similarly comparing 2015 results from other WIP countries. Many internet users in the region feel they can increase their political influence by using the internet, even more so than respondents in some western countries. 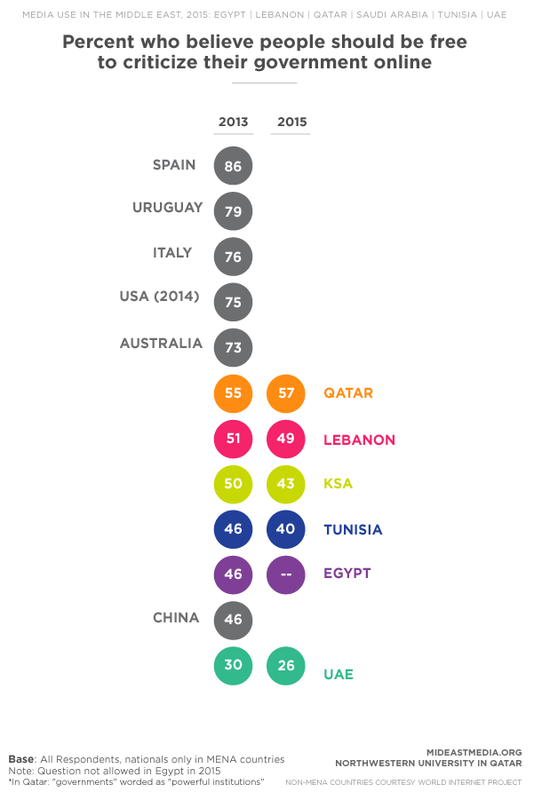 Respondents in countries ruled by autocratic governments—Saudi Arabia, Egypt, Qatar, and China—are more likely to believe in the political utility of the internet than those surveyed in countries like the UK and Italy, where democratic institutions provide established avenues for political activism and influence. Survey research often uncovers great disparity in what people are willing to support in general, that is, for society, and what they prefer or support for themselves.This study shows that, while many respondents in Arab countries say the internet is a safe environment for one to air political speech--and theyoutstrip many western countries in this conviction--they are less likely than those in other parts of the world to feel at ease talking about politics themselves. 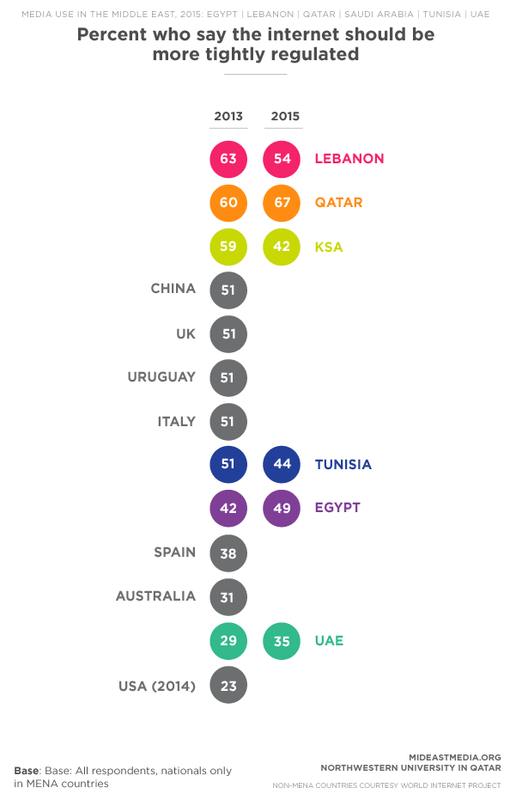 More people surveyed in some western countries like the UK and Italy want greater internet regulation than respondents in the UAE, Saudi Arabia, and Tunisia, and, in this regard, respondents in this survey display more progressivism than those in other parts of the world. 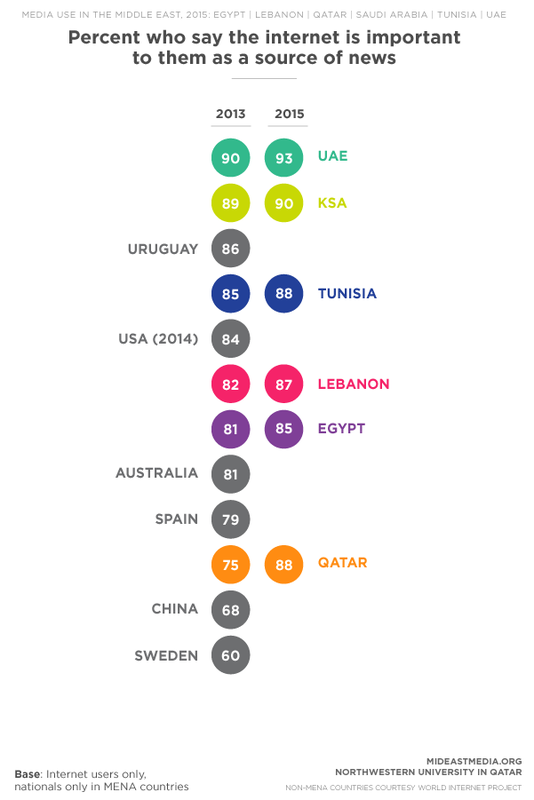 Respondents in Arab states do not overwhelmingly agree, however, that criticism of governments on the internet is a given right. 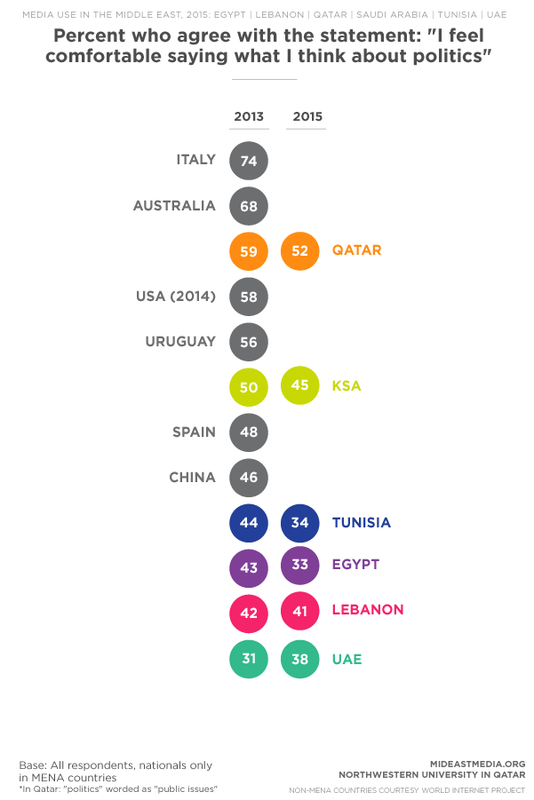 While respondents in the Arab states are among the most likely to feel it is safe for individuals to discuss politics online, they are also among the least likely to support open criticism of governments on the internet. Internet users in Arab countries are less likely to fear governments or commercial entities surveilling them online than in countries like the USA and Spain, which is consistent with demonstrated optimism with regard to the safety of online activity, as more internet users in Arab countries believe political expression online is safe than respondents in other countries. 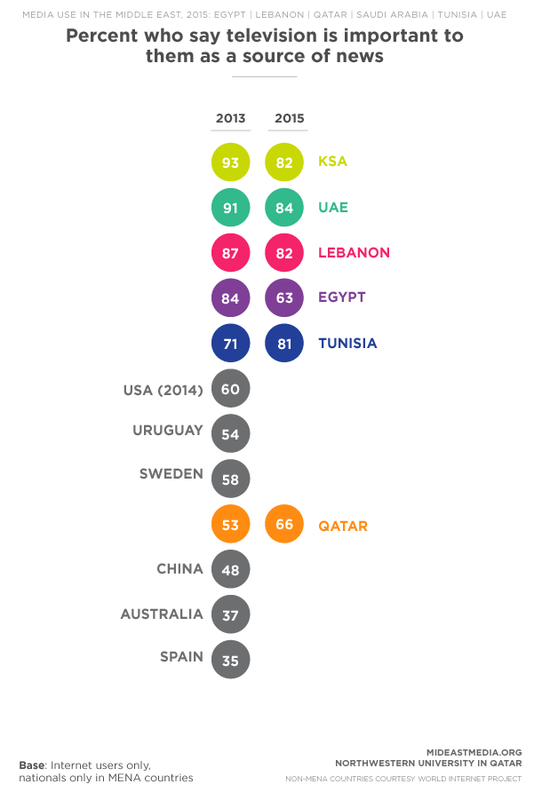 Webizens in the USA are the most concerned about governments checking what they do online, while those in the UAE are the least likely to register the same concern. Television is overwhelmingly cited as an important source of news for Arabs, even among internet users. 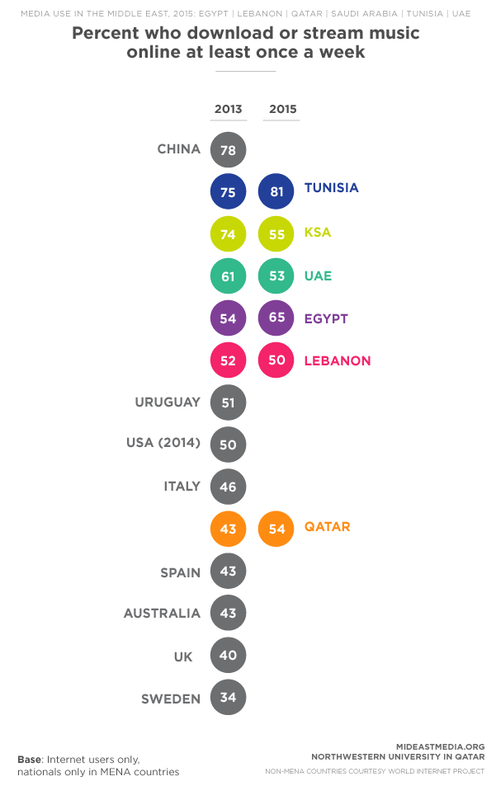 Much more of the Arab world turns to television for information than in other regions. 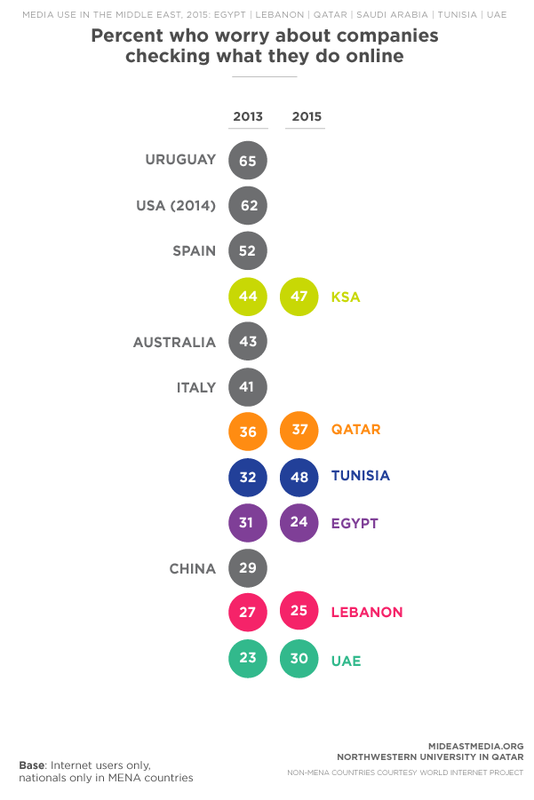 Television has decreased in importance from 2013 to 2025 in all Arab countries except in Qatar and Tunisia, but still more than eight in ten internet users in Lebanon, Saudi Arabia, Tunisia, and the UAE cite TV as an important source of news. 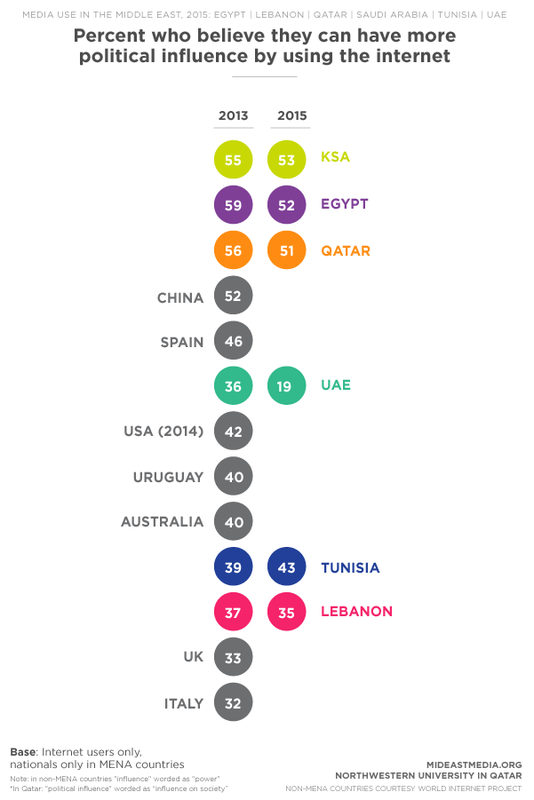 Internet users in the Arab world are far more likely to download or stream music or play games online than internet users in many other countries.While gaming has become more popular in Qatar from 2013 to 2015, they are still behind the rest of the Arab world.